Sokol (Сокол, Russian for "falcon") was a planned high speed train in Russia. It was to be a successor of the ER200 for use on the Moscow–St. Petersburg mainline, and was designed to operate at a cruising speed of 250 km/h. A prototype was built in 2000 and tested by Russian High Speed Railway Shareholding Co. The Sokol project was cancelled in 2002. 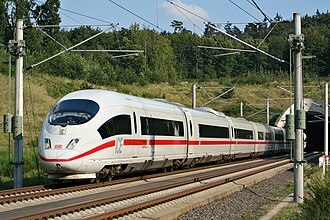 Instead of a Sokol-based design, high speed trainsets (named Sapsan) based on the Siemens Velaro were procured from Siemens in Germany. The Sapsan trains have been operating on the Moscow–St. Petersburg line since December 2009. ^ "Sokol can't fly yet". Railway Gazette International. 1 October 2001. Archived from the original on 16 June 2011. ^ Murray Hughes (1 June 2005). "Broad gauge ICE3 in sight". Railway Gazette International. Archived from the original on 9 August 2011. This Russian rail transport related article is a stub. You can help Wikipedia by expanding it. A turbojet train is a train powered by turbojet engines. Like a jet aircraft, but unlike a gas turbine locomotive, only a handful of jet-powered trains have been built, for experimental research in high-speed rail. Turbojet engines have been built with the engine incorporated into a railcar combining both propulsion and passenger accommodation rather than as separate locomotives hauling passenger coaches, turbojet engines are most efficient at high speeds and so they have been applied to high-speed passenger services, rather than freight. 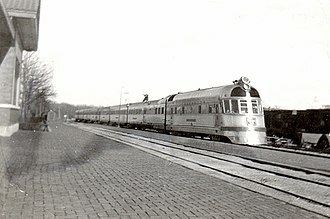 The first attempt to use turbojet engines on a railroad was made by the New York Central Railroad in 1966 and their railcar M-497 was able to reach speeds up to 184 miles per hour. Speed was limited due to the length of track and vehicle acceleration rates, two Pratt & Whitney J52 jet engines were added to the vehicle to propel the vehicle up to higher speeds, after acceleration the engines were throttled back so that the thrust equaled their drag. On 14 August 1974, the LIMRV achieved a record speed of 255.7 mph for vehicles on conventional rail. Those for overhead wires are roof-mounted devices, those for third rails are mounted on the bogies. Typically, they have one or more spring-loaded arms that permit the working engagement with the rail or overhead wire, the collector arm pushes the contact shoe against the contact wire or rail. As the vehicle moves, the shoe slides along the wire or rail to draw the electricity needed to run the vehicles motor. The current collector arms are electrically conductive but mounted insulated on the vehicles roof, an insulated cable connects the collector with the switch, transformer or motor. The steel rails of the act as the electrical return. Electric vehicles that collect their current from an overhead line system use different forms of one- or two-arm pantograph collectors, the current collection device presses against the underside of the lowest wire of an overhead line system, which is called a contact wire. Most overhead supply systems are either DC or single phase AC, three phase AC systems use a pair of overhead wires, and paired trolley poles. The V150 was a specially configured TGV high-speed train notable for breaking the world land speed record for conventional railed trains on 3 April 2007. Operation V150, where 150 refers to a speed in metres per second, was a series of high-speed trials carried out on the LGV Est prior to its June 2007 opening. The trials were conducted jointly by SNCF, TGV builder Alstom, following a series of increasingly high-speed runs, the official speed record attempt took place on 3 April 2007. The top speed of 574.8 km/h was reached at kilometer point 191 near the village of Le Chemin, the 515.3 kilometres per hour, and the last time on 15 April 2007 with a speed of 542.9 kilometres per hour. The train had four powered axles than trainset 325 used in the 1990 speed record. Aerodynamic improvements, similar to the 1990 record train, were refined in a wind tunnel and these improvements included a front air dam, roof fairings over the pantograph openings, membranes to cover the space between the cars, and a flush-mounted windshield. Over 600 sensors were fitted on various parts of both the engines and the cars, the train set ran with larger wheels with a diameter of 1092 mm instead of 920 mm, to limit the rotational speed of the powertrain. The record runs took place on a140-kilometre section of track 1 on the LGV Est, usually heading west, the track superelevation was increased to support higher speeds. Catenary voltage was increased to 31 kV from the standard 25 kV, the mechanical tension in the wire was increased to 40 kN from the standard 25 kN. The speed of the transverse wave induced in the wire by the trains pantograph was thus increased to 610 km/h. Several measurement stations were installed along the test tracks to monitor stresses in the track and ballast, aerodynamic effects, between kilometer posts 223 and 167, where speeds exceeded 500 km/h, the track was under close surveillance. 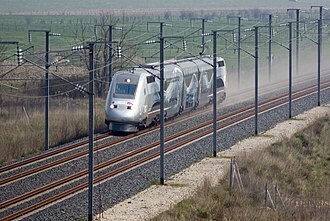 Between 15 January 2007 and 15 April 2007, the V150 train traveled at 500 kilometres per hour, for each high speed run, another TGV performed a sweep of the track before the V150 train was cleared to start. The SCMaglev is a magnetic levitation railway system based on the principle of magnetic repulsion between the track and the cars. The Central Japan Railway Company and the companys Railway Technical Research Institute developed the system, the SCMaglev system uses an electrodynamic suspension system. Installed in the bogies are superconducting magnets, and the guideways contain two sets of metal coils. The current levitation system utilizes a series of coils wound into a figure 8 along both walls of the guideway and these coils are cross-connected underneath the track. As the train accelerates, the fields of its superconducting magnets induce a current into these coils due to the magnetic field induction effect. If the train were centered with the coils, the potential would be balanced. However, as the runs on rubber wheels at relatively low speeds. This creates a magnetic field opposing the superconducting magnets pole. Once the train reaches 150 km/h, there is sufficient current flowing to lift the train 100 mm above the guideway and these coils generate guiding and stabilizing forces. 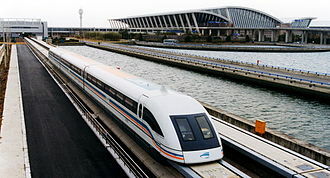 Because they are cross-connected underneath the guideway, if the train moves off-center, SCMaglev utilizes a linear synchronous motor propulsion system, which powers a second set of coils in the guideway. Japanese National Railways began research on a linear propulsion railway system in 1962 with the goal of developing a train that could travel between Tokyo and Osaka in one hour, the railway made its first successful SCMaglev run on a short track at its Railway Technical Research Institute in 1972. In 1977, SCMaglev testing moved to a new 7 km test track in Hyūga, by 1980, the track was modified from a reverse-T shape to the U shape used today. In April 1987, JNR was privatized, and Central Japan Railway Company took over SCMaglev development, in 1989, JR Central decided to build a better testing facility with tunnels, steeper gradients, and curves. Construction of the Yamanashi maglev test line began in 1990, the 18.4 km priority section of the line in Tsuru, opened in 1997. MLX01 trains were tested there from 1997 to fall 2011, when the facility was closed to extend the line to 42.8 km, in 2009, Japans Ministry of Land, Infrastructure and Tourism decided that the SCMaglev system was ready for commercial operation. The TGV Duplex is a French high-speed train of the TGV family, manufactured by Alstom, and operated by the French national railway company SNCF. It is unique among TGV trains in that it features bi-level carriages, the Duplex inaugurated the third generation of TGV trainsets. It was specially designed to increase capacity on high-speed lines with saturated traffic, with two seating levels and a seating capacity of 508 passengers, the Duplex increases the passenger capacity. While the TGV Duplex started as a component of the TGV fleet. The LGV Sud-Est from Paris to Lyon is the busiest high-speed line in France, after its opening in 1981 it rapidly reached capacity. Several options were available to increase capacity, the separation between trains was reduced to three minutes on some TGV lines, but the increasingly complex signalling systems, and high-performance brakes required, limited this option. Another option is to widen the train but is not practicable due to loading gauge restrictions. Running two trainsets coupled together in multiple-unit configuration provides extra capacity, but required very long station platforms, given length and width restrictions, the remaining option is to adopt a bi-level configuration, with seating on two levels, adding 45% more passenger capacity. TGV Duplex sets are run with a single deck Réseau set or another Duplex set. The Duplex feasibility study was completed in 1987, in 1988, a full-scale mockup was built to gauge customer reactions to the bi-level concept, traditionally associated with commuter and regional rail rather than with high-speed intercity trains. Discussions with GEC-Alsthom began soon after, and in July 1990 the company won the contract to build the TGV-2N, the contract was finalized in early 1991, at which point the official order was made. The first tests of a trainset in were November 1994. Soon after their first run, the first rake of eight trailers was tested at 290 km/h on the Sud-Est line, the trainset was powered by TGV Réseau power cars at the time, as the Duplex power cars were not ready. The concept aims to eliminate rolling resistance and allow very high performance, while simplifying the infrastructure needed to lay new lines. Hovertrains were seen as a relatively low-risk and low-cost way to develop high-speed inter-city train service, by the late 1960s, major development efforts were underway in France, the UK and the USA. While they were being developed, British Rail was running an extensive study of the problems being seen at speeds on conventional rails. This led to a series of new high-speed train designs in the 1970s, although the hovertrains still had reduced infrastructure costs compared to the APT and similar designs like the TGV, in practice this was offset by their need for entirely new lines. Conventional wheeled trains could run at low speed on existing lines, interest in hovertrains waned, and major development had ended by the mid-1970s. 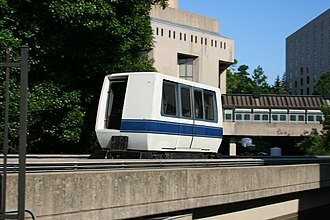 Hovertrains were developed for systems, including personal rapid transit systems that were a hot topic in the late 1960s. In this role their ability to float over small imperfections and debris on the rails was a practical advantage, the only hovertain to see commercial service was the Otis Hovair system. Originally developed at General Motors as an automated guideway transit system, the design eventually ended up at Otis Elevator who replaced its linear motor with a cable pull and sold the resulting design for people mover installations all over the world. 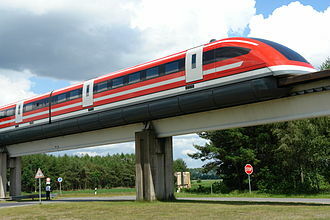 News sources often conflate maglev trains with hovertrains, as both are levitated above the surface, hovering over them. It was noticed early on that the energy needed to lift a hovercraft was directly related to the smoothness of the surface it traveled on. What was surprising was that the amount of energy lost through this process could be lower than steel wheeled vehicles and that meant that for travel above some critical speed, a hovercraft could be more efficient than a wheeled vehicle of the same weight. Better yet, such a vehicle would all of the positive qualities of a hovercraft. China Railways CIT trains refers to high-speed test trains that are used on the Chinese High Speed railways, CIT means Comprehensive Inspection Train. Usually ordered by Chinese Ministry of Rail or China Academy of Railway Sciences, cRH5J-0501 is an 8-car trainset based on CRH5 design, service as 250 km/h test train. 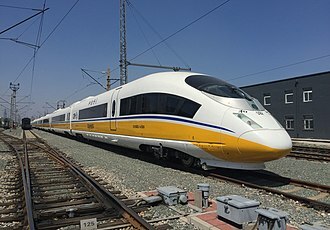 The CIT001 was ordered by China Academy of Railway Sciences On April 2,2007, the train is painted with yellow and white color and started test run on July 1,2007. 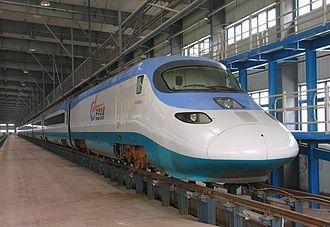 Came into service on June 6,2008, formation CRH2A-2010 is the first ever high-speed test train of China, it is the first CRH2 trainset manufactured by CSR Sifang, the trainset rolled off the line on July 31,2006. In March 2007 it was converted to be 250 km/h test train, the train is equipped with ATP, the signal parameters, the wireless field and catenary, track geometry and acceleration detecting devices and circuit-monitoring system. Formation CRH2C-2061 is the first 300 km/h High Speed trainset manufactured by CSR Sifang, during the test on April 22,2008, CRH2-061C reached a top speed of over 370 km/h on Beijing-Tianjin high-speed rail. Two three-car and one four-car GCT electric multiple unit trains have been built for testing. The first GCT train was completed in October 1998, the train was formed as shown below, with all three cars motored. Car 1 was built by Kawasaki Heavy Industries, car 2 was built by Kinki Sharyo, and car 3 was built by Tokyu Car Corporation. After preparation at the Railway Technical Research Institute in Kokubunji, from April 1999, the train was shipped to the Transportation Technology Center in Pueblo, United States for an extended period of high-speed endurance running until January 2001. Here, it recorded a speed of 246 km/h and ran a total distance of approximately 600,000 km. In November 2002, the recorded a maximum speed of 130 km/h on the Nippo Main Line in Kyushu. From May to June 2003, the train was tested for the first time in Shikoku, testing on the Sanyo Shinkansen commenced on 23 August 2004 between Shin-Yamaguchi and Shin-Shimonoseki stations, delayed from the initial plan for testing to start during fiscal 2002. A series of 15 return test runs were conducted late at night between 23 August and 27 October 2004, starting at a speed of 70 km/h on the first day. The maximum speed was increased to 100 km/h on the second day, testing ended in 2006, after which the train was stored at JR Kyushus Kokura Works. In April 2007, the train was moved to storage at JR Shikokus Tadotsu Works, two of the cars were cut up on-site, but one end car, number GCT01-1, was moved to Kawasaki Heavy Industries Kobe factory in February 2014. Initially scheduled to be completed in 2004, the train was delivered in 2006. In March 2007, the train was shipped from the RTRI in Kokubunji to Kokura Works and this train was based on the E3 Series Shinkansen, and included passenger seating in the intermediate car. Maximum speed was 270 km/h on Shinkansen lines operating under 25 kV AC, the train was formed as shown below, with all cars motored. Car 2 was fitted with 36 seats, tilting mechanism, the end cars were 23,075 mm long, and the intermediate car was 20,500 mm long. 25 kV alternating current electrification is commonly used in railway electrification systems worldwide, especially for high-speed rail. 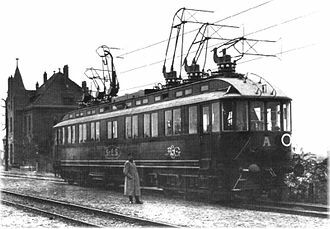 This electrification is ideal for railways that cover long distances or carry heavy traffic, after some experimentation before World War II in Hungary and in the Black Forest in Germany, it came into widespread use in the 1950s. Railways using older, lower-capacity direct current systems have introduced or are introducing 25 kV AC instead of 3 kV DC/1.5 kV DC for their new high-speed lines. The first successful operational and regular use of the 50 Hz system dates back to 1931 and it was developed by Kálmán Kandó in Hungary, who used 16 kV AC at 50 Hz, asynchronous traction, and an adjustable number of poles. The first electrified line for testing was Budapest–Dunakeszi–Alag, the first fully electrified line was Budapest–Győr–Hegyeshalom. Although Kandós solution showed a way for the future, railway operators outside of Hungary showed a lack of interest in the design. The first railway to use system was completed in 1951 by SNCF between Aix-les-Bains and La Roche-sur-Foron in southern France, initially at 20 kV but converted to 25 kV in 1953. 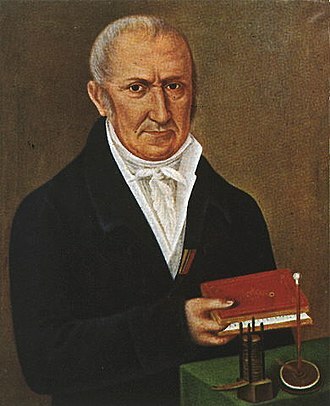 The main reason why electrification at this voltage had not been used before was the lack of reliability of mercury-arc-type rectifiers that could fit on the train. This in turn related to the requirement to use DC series motors, until the early 1950s, mercury-arc rectifiers were difficult to operate even in ideal conditions and were therefore unsuitable for use in the railway industry. It was possible to use AC motors, but they did not have a characteristic for traction purposes. This was because control of speed is difficult without varying the frequency and this is why DC series motors were the best choice for traction purposes, as they can be controlled by voltage, and have an almost ideal torque vs speed characteristic. 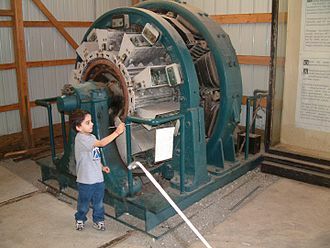 In the 1990s, high-speed trains began to use lighter, lower-maintenance three-phase AC induction motors. 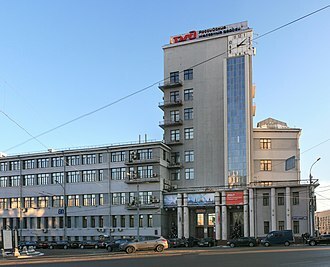 Headquarters of the Russian Railways in Moscow. Close up of a single arm pantograph on a British Rail Class 333. Allegro train ticket from St. Petersburg to Helsinki. CRH380BJ-A-0504, another inspection train built for low temperature conditions in Northeast China, at the China Academy of Railway Sciences. Bi-level carriages allow 45% more capacity than in a single level TGV. Tracked Hovercraft test system, the RTV 31. T 001 seen from the A4 motorway in Bischheim.